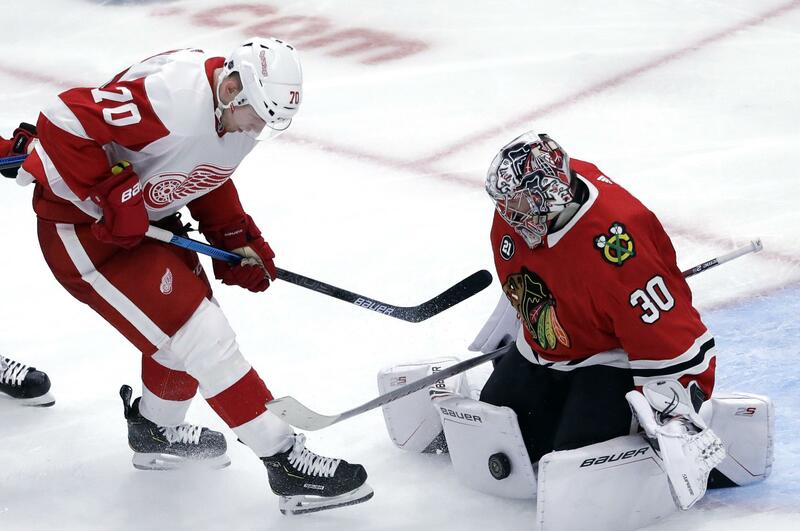 CHICAGO – Dominik Kahun had two goals and an assist, Cam Ward made 43 saves and the Chicago Blackhawks the Detroit Red Wings 5-2 on Sunday for their seventh straight victory. After Detroit pulled within one in the third period, Patrick Kane responded for Chicago with his 33rd goal. Kane made it 4-2 when he beat Jonathan Bernier low on the stick side with 3:33 left, extending the NHL’s longest active points streak to 14 games. Kane tacked on an assist on Jonathan Toews’ empty-netter with 2:01 remaining. It was Toews’ 25th of the season. Gustav Nyquist and Christoffer Ehn scored for Detroit. BOSTON – Brad Marchand scored 4:03 into overtime and Boston beat Colorado to extend its points streak to seven games. BUFFALO, N.Y. – Blake Wheeler scored the go-ahead goal with 3:55 remaining and Winnipeg beat Buffalo to snap an 0-2-1 skid. NEW YORK – Devon Toews scored the tiebreaking goal early in the second period, Thomas Greiss stopped 26 shots and New York beat Minnesota. NASHVILLE, Tenn. – Vladimir Tarasenko completed a hat trick 16 seconds into overtime and St. Louis beat Nashville to sweep a home-and-home set with their season-best sixth straight victory. NEWARK, N.J. – Marcus Johansson scored twice, Keith Kinkaid made 32 saves and New Jersey prevented Carolina from moving into a playoff spot. Nico Hischier set up all three goals to help the Devils snap the Hurricanes’ three-game winning streak and hand them only their fifth loss (13-5-1) in 19 games. Pavel Zacha also scored for the Devils. Published: Feb. 10, 2019, 7:29 p.m.